Staff prepared a nice salad of butter lettuce, carrots, and home-grown tomatoes. It turns out that Jeff enjoys butter lettuce. Why does staff bother with cat food? Just set a place at the table for the noble one. 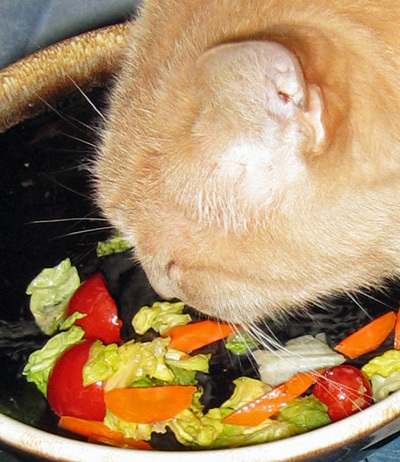 A cat who eats lettuce/ Now I really have seen everything. Jeff is a true omnivore. Variety is the spice of life and stuff. Butter lettuce! Really Jeff? Tell me this is just a trick to get all those delicious little furry creatures to think you are harmless right? So you go out and graze in the yard next to your little vegetarian “friends” and then BAM! jaws of death. My previous cat used to eat beansprouts and mushrooms. (Potatoes, though, he thought were balls to be fished out of the pan and patted around the house.) Generally, with cats, if you aren’t supposed to eat it, it tastes better. Food in your own bowl is frequently poisonous. uh, jeff? that isn’t food. that is the stuff that food eats. He is a nomnivore. NOM NOM NOM! That cat does nothing but amaze me! I mos’ sen’ you sorm abocado to ead weeth thad. Happy, Happy Christmas and Holidays to Jeff, Rita, Norman, the dog, and staff! Hi. My cat goes crazy for lettuce! I will take it out and wash it and she jumps on the counter for it. She usually pays no interest with what we ‘re eating and NEVER jumps on the counter. I’ve done the cucumber thing on my eyes and I’ll put them aside and she’ll eat one. She also likes carrots. How Bizarre! I’m glad she’s not alone. Jeff is Cool. I’m glad to find his story.